Many kinds of interconnection appear in a mess: cause-and-effect, influence, ‘belonging-to’ and ‘being part of’, dependency and many others. These provide the basis for a suite of diagrams – collectively called systems diagrams – that map the often-dense interconnections. Systems diagrams – with the exception of systems maps (see Chapter 8 of the book) – are not primarily diagrams of systems. Systems diagrams are systemic because they include relationships as well as entities. It is often possible to identify parts of systems diagrams as representing systems but this is not their primary purpose. Diagramming is not a methodology. It does not tell me what to do. In diagramming, the systems thinker organises their thinking about a messy situation rather than attempting to discover ‘truth’. Thus, many of the benefits of diagramming emerge from the diagramming process, rather than from the finished diagram. Diagramming helps me to ‘see’ the messy situation differently, to diagnose messes that seem not to respond to treatment, and to think about improving the situation. I discover clarity through a conversation between me and the diagram I am drawing – rather like talking to a clear-headed friend. The conversation ranges across me, my diagram, the ‘rules’ for that diagram and the mess itself. The diagram below shows this conversation as a system of mutual influences. With practice, I learn to ‘see’ webs of interconnection in a messy situation – without necessarily drawing the diagrams. Diagramming builds my capacity for seeing the world systemically. An influence diagram of my diagramming practice. In an influence diagram, arrows mean 'influences’. I have identified the mutual influences in a ‘conversation’ – between me, the diagram I am drawing, the diagramming ‘rules’ and the messy situation – as a system because they seem to represent a whole: my diagramming practice. 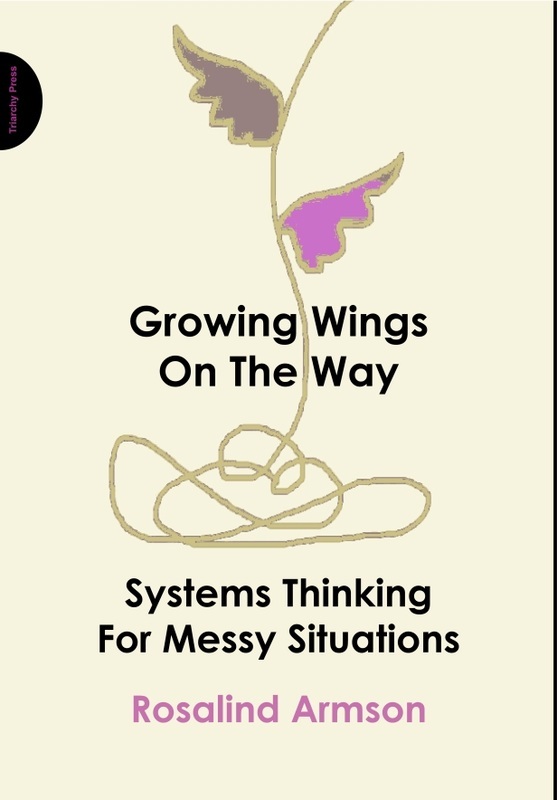 The system has the emergent properties of improving my understanding of the messy situation and, in the longer term, improving my ability to see the web of interconnections in the world. Diagrams come in many forms, but in systems thinking I can think of them as models. All models are partial representations. They do not show everything. Maps of metropolitan transport networks, for example, do not show distances or compass bearings. They simply show the relationship between stations connected by the railway lines. Systems diagrams are similarly partial; they only show some of the features of the situation. Like a slice through a fruit cake, I may not see all the ingredients (cherries, peel, sultanas, etc.) but I shall begin to see beyond the surface characteristics to the essence of the cake. Architectural models transcend ‘reality‘ to represent structures that exist only as concepts. Thus, a plan of a house not yet constructed, or a diagram of the social relationships within a neighbourhood, is still a model. The same is true of systems diagrams. In each case, there can be many different perceptions of the ‘reality‘ the diagram captures. No one conception is more real than any other, although people often believe their own is the only possible conception and assume that it is shared by everyone else. So, to be comparable and readable, diagrams modelling messy situations follow agreed conventions, selecting those features of most interest in a situation, and showing the relationships between them. building your ability to perceive important interconnections. Drawing diagrams to clarify a messy situation is the first and most obvious use for a diagram. Diagramming for understanding and clarification is a messy business, starting as it does from confusion and messiness. It involves lots of half-formed ideas, lots of crossing out, lots of fresh starts and lots of scrap paper. Don’t be afraid of getting it wrong. It is inevitable. In fact, getting it wrong enables me to see where I got it wrong and then to draw it again, but better. Would-be systems diagrammers will need lots of paper. I collect one-side-only waste paper from office printers and photocopiers. Iterative drafting is faster, more effective and more efficient when I draw diagrams by hand. Something about computer-drawing seems to snag diagrams in ways that make the outcome slower and less satisfactory. I encourage beginners – in fact almost everyone – to use hand drawing to create their diagrams-for-clarifying and to use a computer only to draw diagrams for presentation. Keep all your drafts, numbering them if it seems appropriate. Date the final version, if not all of them. Take notes of ideas and questions as they arise. Notes-on-the-side represent your developing understanding of the situation. It is often hard to know where to start. If you have a rich picture, you may have identified themes within it. You can start any diagram by attempting to diagram the theme. For example, I identified ‘money’ as one of the themes of my rich picture (see Chapter 3 of the book). My next diagram was a systems map around the theme of money that evolved into a systems map of ‘Mum’s present and future resources’ (see Chapter 8 of the book). Diagrams have ‘rules’. Rules are a way of testing and refining your thinking. Breaking the rules is, of course, permissible but the temptation to break them often comes from trying to avoid one’s own confusions. Be wary of giving in. Some rules are concerned with the conventions of a particular diagram type. These rules often determine what arrows mean, for example. Creating hybrid diagrams is another temptation and again, it usually arises when one’s thinking is still unclear. My suggestion is to accept the challenge of sticking to the conventions. To extend my metaphor of the diagram as ‘clear-headed friend’, the ‘rules’ provide the clear-headedness. Draw two diagrams of different types rather than one that muddles two sets of conventions. Some of my most important diagramming insights have come from sternly facing down the temptation to invent a new type of diagram. But, on the other hand, always privilege enhanced understanding over blind adherence to the rules. Diagrams need titles – not least so that you know what type of diagram it is and how to interpret it. The latter is not always obvious when you come back later. Add the title only when you know what your diagram is about – usually only apparent after you have drawn it. Many times, I have started a diagram believing I am drawing, for example, a diagram of UVW, only to find, when it is finished, that it is actually a diagram of XYZ. All part of the un-muddling process. How do you know when the diagram is complete? Each diagram has its own set of rules for ensuring completeness but, in broad terms, a completed diagram is only ever ‘completed for now’. There is a quality of obviousness about a complete diagram. It hangs together as if it were inevitable or obvious. This does not mean it was inevitable or obvious. Really useful diagrams arise from thorough exploration, careful observation, and rigorous understanding of the situation. Only hindsight makes it seem obvious. Teams pick up ideas very quickly when presented with a large diagram. Diagrams make excellent ‘mediating objects’ for small teams working through complex ideas. People argue with the diagram, not each other, and stay focused on getting the diagram right and building shared views. Drawing the diagram by hand on a large sheet of paper, and providing felt-tipped pens, frees team members to alter or add to it. Small diagrams or ones that look finished discourage contributions. People contribute more and better ideas if they feel they can change the diagram. This can be uncomfortable when you have laboured for hours the night before to get it right but, if they have contributed to the ideas and diagram, the team will own a common commitment. As friends and colleagues become used to diagrams, the discussions can take place as they develop a diagram together. Deeper engagement comes from drawing diagrams together as a joint enterprise. Diagramming in groups is challenging. It quickly reveals the diversity of perspectives so that they can be discussed, widening the perspective of each diagrammer. Once the tensions of surfacing different perspectives resolves, diagrammers can then incorporate a wider range of knowledge and understanding, producing a richer diagram and expanding everyone’s mental models of the situation. Diagrams are an efficient way to present complex ideas when the audience is receptive. Unskilled readers often dodge diagrams in reports so a diagram in an unfamiliar format may not communicate effectively. For example, people typically interpret arrows as meaning ‘leads to’ or a similarly vague or time-sequenced interpretation. However, in a presentation, where the presenter can explain the diagram, diagrams communicate very efficiently. Systems thinkers consider their audience, and the context, in deciding whether to use diagrams for presenting an idea. Converting hand-drawn diagrams to presentation-quality for a presentation or report can be problematic. Scanning neat hand-drawing is one option, although hand lettering undoubtedly retains an informal appearance. Diagramming software is another solution, although many packages – including some of the most famous ones – produce very poor systems diagrams. Curved arrows seem to be the problem. The best ones allow you to move blobs and words with any attached arrows following. A digital camera is a useful item in meetings that produce diagrams. Photograph the diagrams for re-drafting, circulating or for actioning outcomes. As people develop their systems-diagramming skills, they begin to ‘see’ systemic interconnection in the world. It is as if they see fragments of diagrams without drawing them. This builds their ability to think systemically and become even better at managing messy situations. Diagrams are a brilliant way of building systems thinking into everyday thinking skills. The following chapters present a number of diagrams. Most people begin with only one or two diagram types. Be aware of all the types of diagrams available but become good at just a few before you engage with more. Try not to choose. Engage with each diagram type once and wait for an opportunity. Then practise by drawing the appropriate diagram, with this book beside you. Let the situation decide. Eventually your diagramming skills become an interaction between you, the situation you are trying to manage, the diagram type and your goals. Whichever diagrams become your own specialities, let the process of diagramming be the means of understanding the situation better and a means to develop your own systems-thinking skills. In Chapters 10 and 11 of the book, I describe diagrams that most effectively deal with messy situations and develop systems-thinking skills. I have excluded many types because they are not as systemic as those itemised in the systems map below. I drew this diagram to convey the general shape of Chapters 10 and 11.